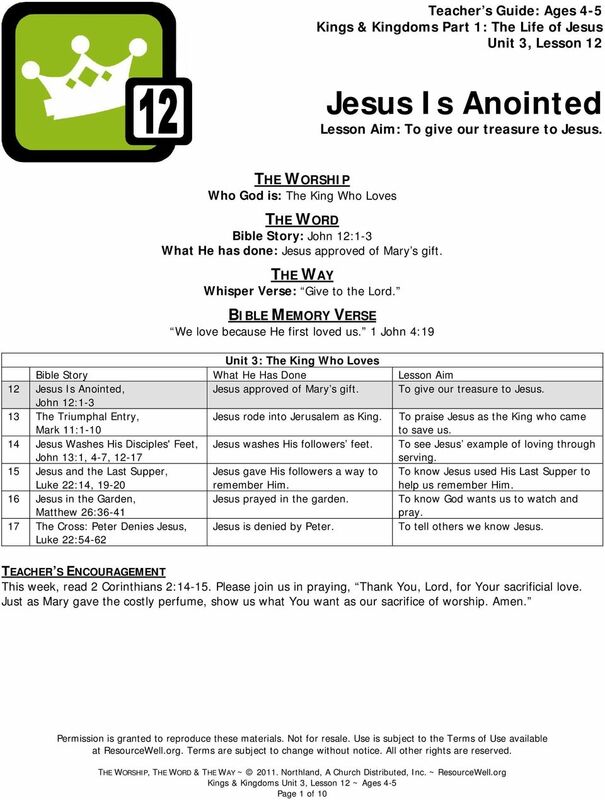 Download "Jesus Is Anointed Lesson Aim: To give our treasure to Jesus." Giving Sight to the Man Born Blind Lesson Aim: To see God purposefully made everyone with different needs to show His greatness. 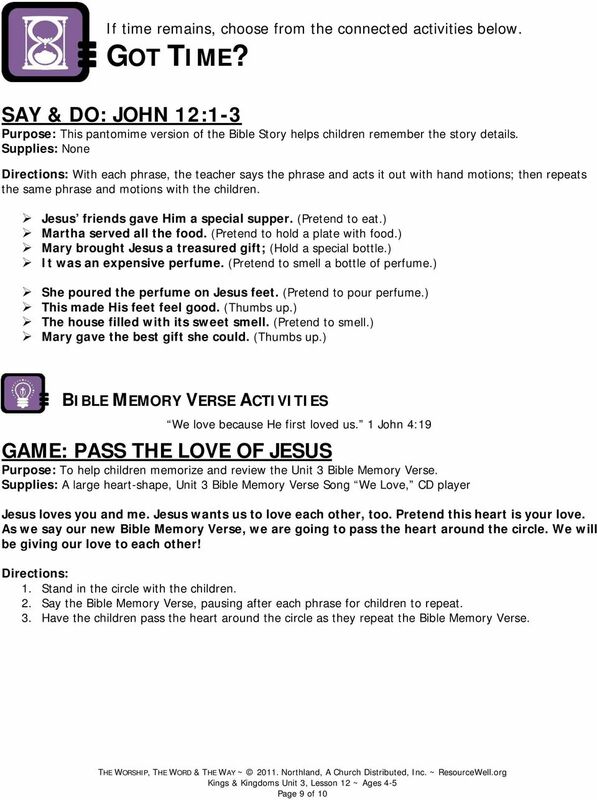 Nehemiah Rebuilds the Wall Lesson Aim: To know we should work hard together. 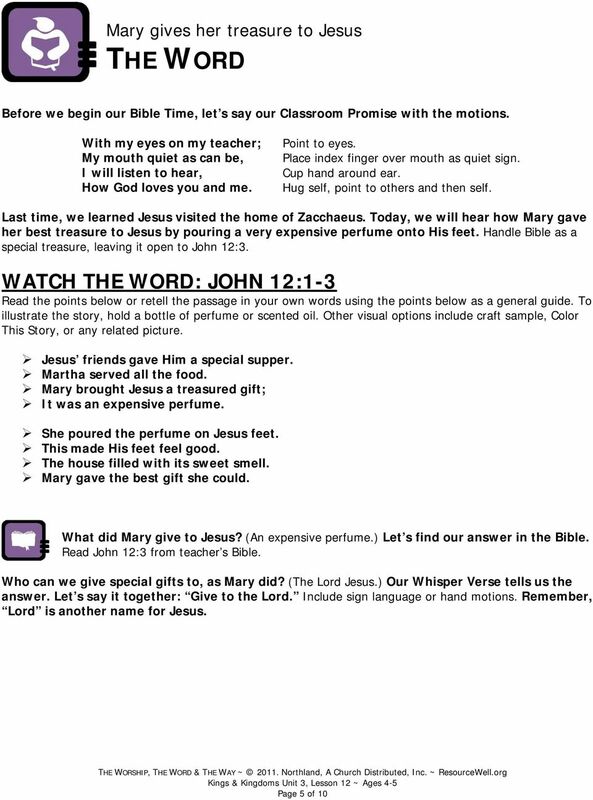 Jesus and the Last Supper: Part 2 Lesson Aim: To remember what we have learned about Jesus. King Solomon Asks to Be Wise: Part 2 Lesson Aim: To know it is wise to obey God. 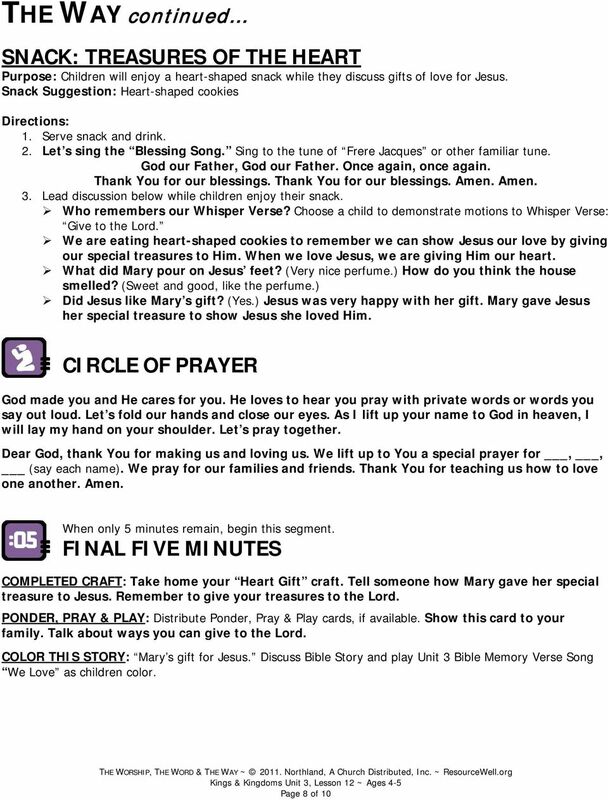 Teacher s Guide: Adaptation for Children with Disabilities Kings & Kingdoms Part 2: Joshua through Esther Unit 9, Lesson 44 King Solomon Asks to Be Wise: Part 2 Lesson Aim: To know it is wise to obey God. 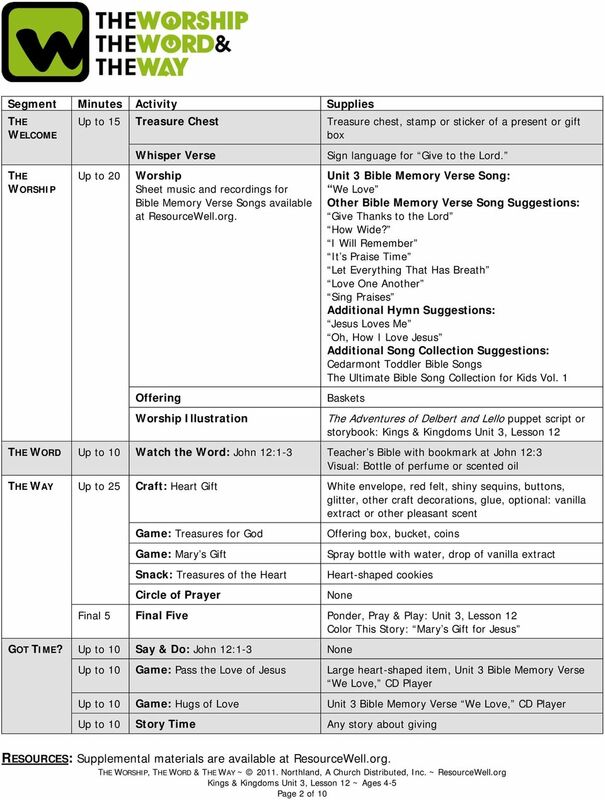 Nehemiah Rebuilds The Wall: Part 1 Lesson Aim: To learn how we can work together. 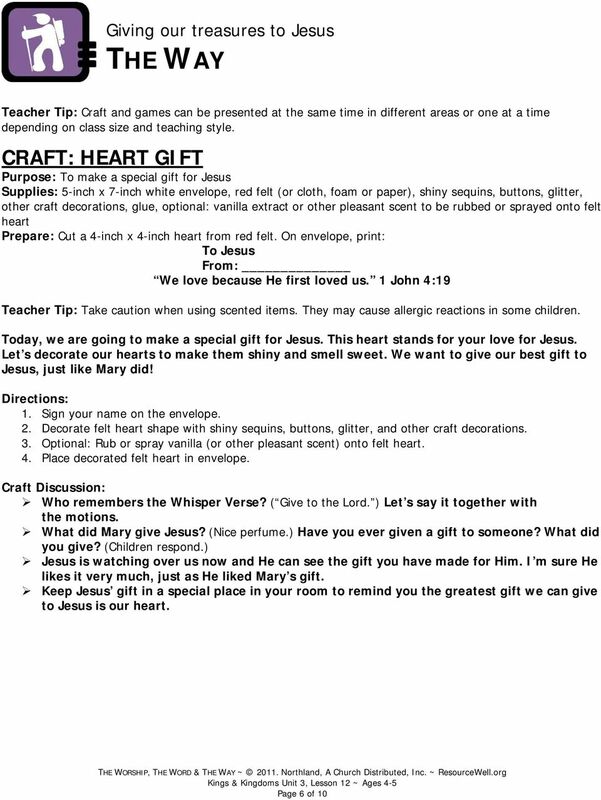 Teacher s Guide: Adaptation for Children with Disabilities Kings & Kingdoms Part 2: Joshua through Esther Unit 9, Lesson 45 Nehemiah Rebuilds The Wall: Part 1 Lesson Aim: To learn how we can work together. King Solomon Asks to Be Wise: Part 1 Lesson Aim: To know we should ask God for wisdom. Twos. February 13-14, February 20-21, and February Jesus feeds Jesus gives us what we need. 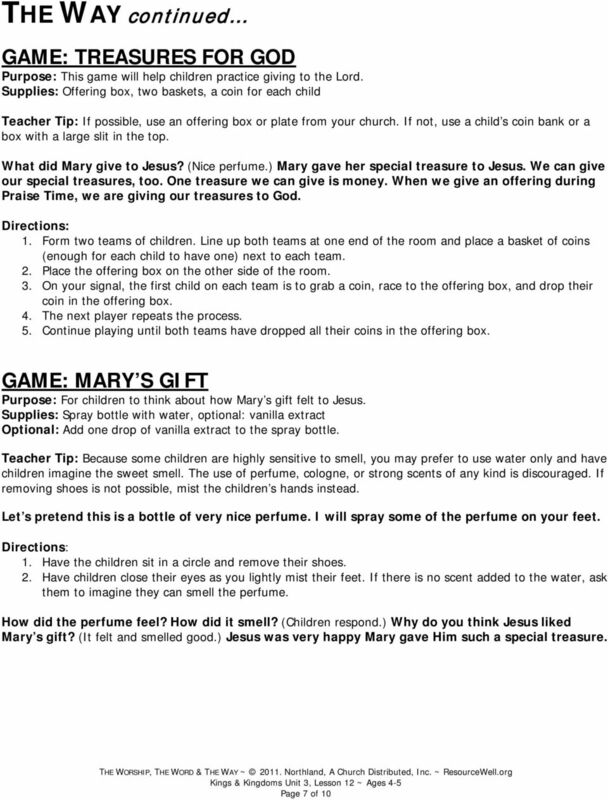 Jesus and Nicodemus Lesson Aim: To consider personal salvation and discover the meaning of being born again. Powerful Praise. Bible Verse: Let everything that hath breath praise the LORD. Praise ye the LORD (Psalm 150:6). Unit 3: Moving Toward Maturity Lesson 10. Discussion Questions. Why not? (Because He is a Spirit.) phone or the computer? (In our hearts. DEATH AND LIFE ARE IN THE POWER OF THE TONGUE; AND THOSE WHO LOVE IT WILL EAT ITS FRUIT FOLLOW UP ACTIVITY WHAT DID GOD SAY? 3PK. Sept 20-21, Samuel Listens to God. I Samuel 3. God wants to talk to us.